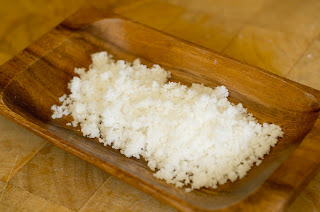 I am, however, going to share a great tip today about making your own garlic salt. For some reason, I'm either always out of the stuff or it's been so long since I used it that it's all caked at the bottom of the jar. The other day, I realized I was out, but really wanted to use some on baked kale chips. Then the proverbial light bulb went off over my head...and I made some from scratch! It takes all of 5-10 minutes to make and really tastes fresh--I guess anything's fresher when it doesn't come out of a plastic bottle! I made extra to have on hand and stored it in an airtight container in the refrigerator, but it didn't last long. The garlic salt turned a greenish tint, which although wasn't mold-based, did turn me off from using it. This should last a few days in the fridge, but it's easy enough to make it on demand whenever you need it! 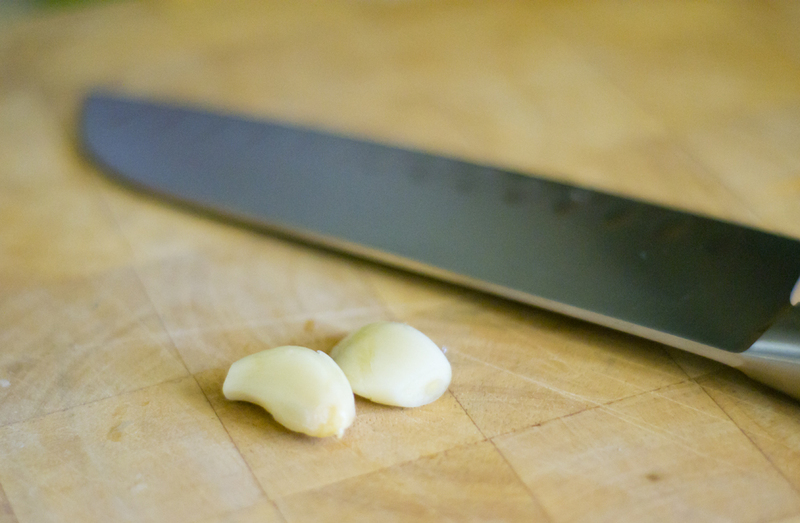 First, peel and trim your garlic. I used two cloves for this batch, which made about 1/4 cup. Roughly chop the garlic and place in a mortar bowl. Add about a tablespoon of Kosher salt and using a pestle, grind into a paste. 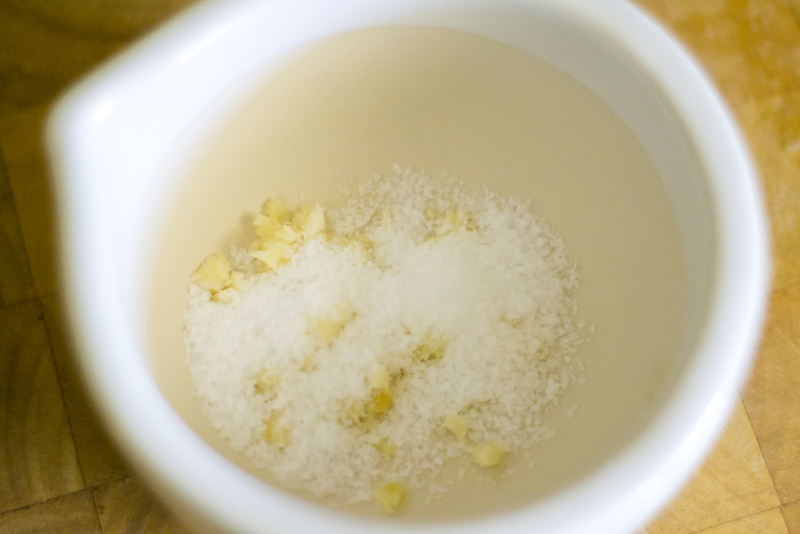 Continue adding Kosher salt until the mixture is no longer paste-like and looks more like salt. And that's it! Use it as you would with store-bought garlic salt. It tasted delicious on the kale chips, but I bet it would also be great on popcorn! 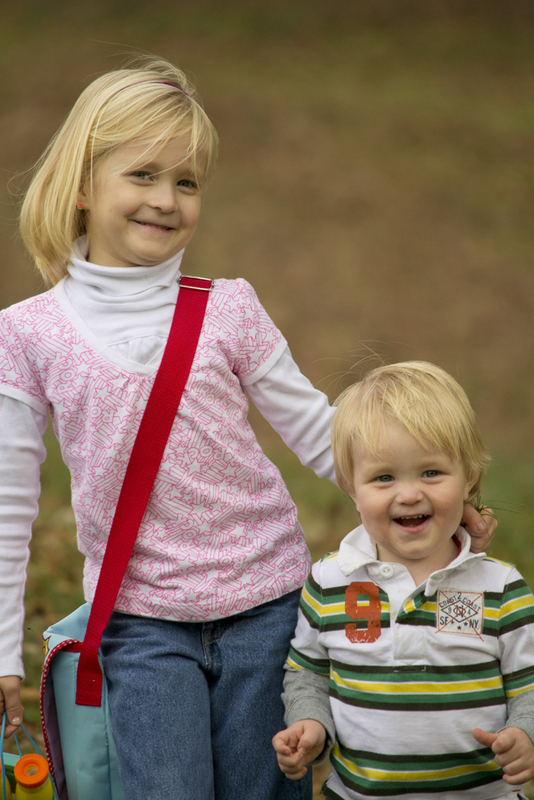 I loved getting to see your kids! They are adorable and look so much alike. I hear ya on trying to balance all that you have to do with all that you want to do. There's a fine line for sure. Enjoy the holidays! By the way, do you still need me to guest post while you're gone? Am I supposed to have that ready for you this month? Alas, it has slipped my mind amongst all the other things I have stored up there! Guest post...I nearly forgot. LOL How do you balance "real life" and blogging???? When things are going smoothly, I take several days and get my food prepared and photographed. I make notes and then I write blog pieces as needed. But real life is more important than blog life....your kids won't be kids forever....enjoy the here and the now. 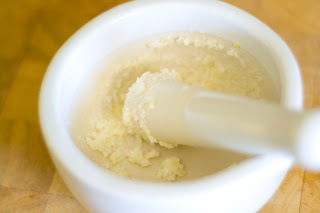 what if you baked the garlic-salt combo w/ low heat & then grind it - think it would not go bad /turn green : ) ?? @Anon, Hmmm...maybe? If you try it and it works, let me know! yumm dish.. thanks for sharing. Cheating Playing Cards in Delhi India from Our Poker Playing Cards Shop in Cheap Price. In order to save space in your moving truck, you may have considered dismantling some furniture. This is a good idea to optimize the space in your utility but also to have less heavy furniture and less bulky to transport once disassembled.PERFECT MOVERS DUBAI and Abu dhabi will make proper preparation to make your move smooth. It looks delicious, why don't you deliver it via Packers and Movers in Keelkattalai, Packers and Movers in Ramapuram, Packers and Movers in Ekkatuthangal,Packers and Movers in Nolambur and Packers and Movers in Chennai.